I got five of my Deffkoptas finished today with one day left in the month. Unfortunately I was not able to get my buzzsaw deffkopta done for the challenge, but I am going to keep working on it. Four months down, eight more to go. 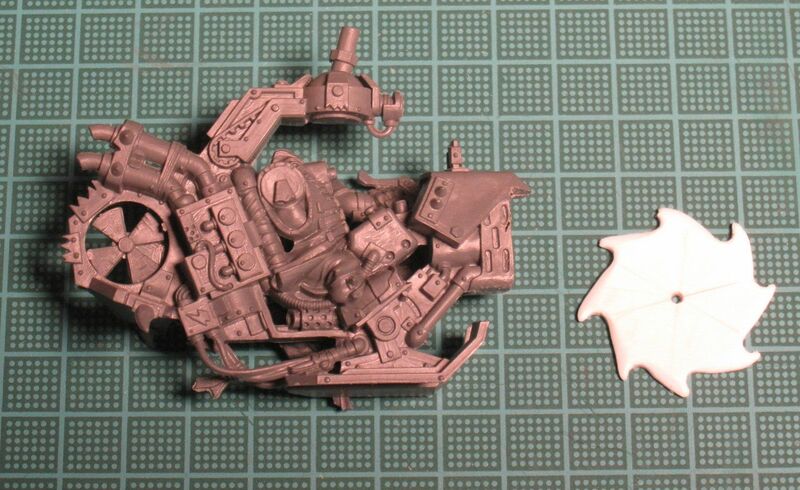 Next up, an Ork Battlewagon. Just an interesting and odd note, but since I upgraded my Photobucket account I have been able to track the sites that have linked to my pictures. The above picture of my Deffrolla Battlewagon has apparently begun touring across Europe. It first appeared last week in Denmark on the forums of Powerfist.dk. 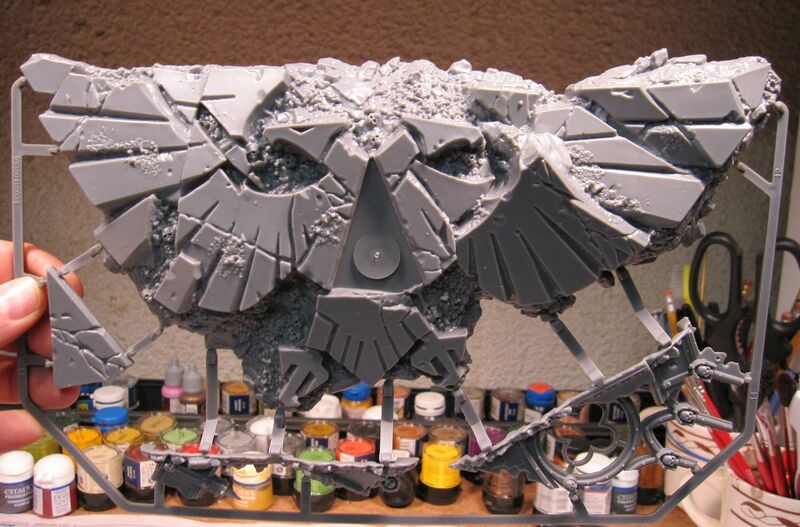 Earlier this week, it was sighted in Poland on the forums of WH40k.pl. Since I do not speak or read Danish or Polish, I used a free translation site to translate them. In Denmark, the battlewagon deffrolla was used as an example for NOT allowing an embarked unit to disembark in front of the deffrolla. I did not have much luck translating the Polish forum posts but as far as I can tell, it was used as a good example of a proper deffrolla. 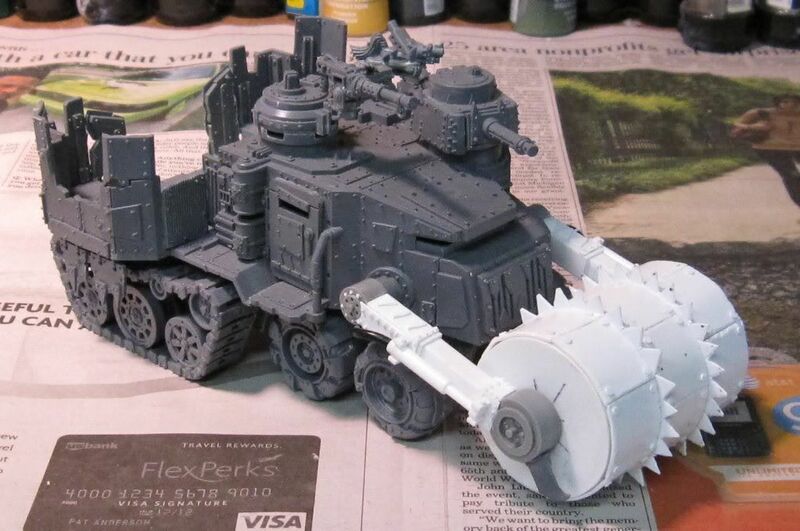 In honor of this mystery tour, I have decided to paint this battlewagon as my Heavy Support unit for the month of May in the 2010 Painting Resolution Contest. Here's to hoping it continues it's tour. After intently looking at Ogre Kingdoms, Lizardmen, Tomb Kings, and Warriors of Chaos, I decided to go with Ogres. Why? They seem like they would be the funnest army to play. It seems like most people do not think they are a competitive army right now, but that is fine with me. 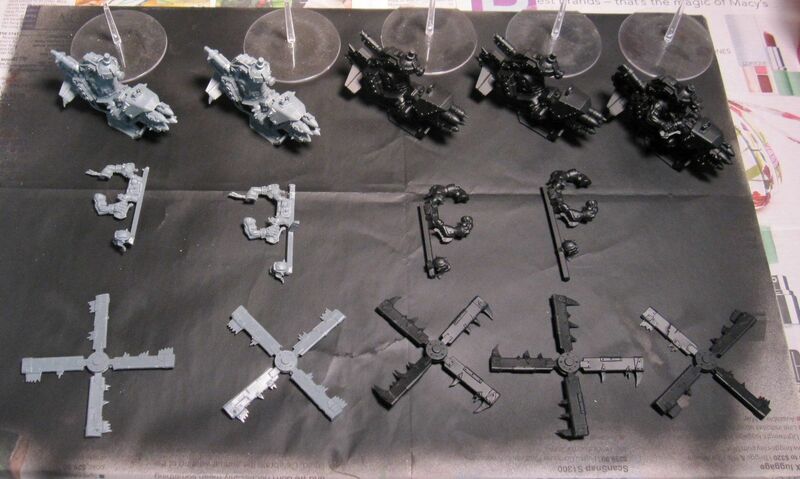 It will take some time to get them assembled and painted, and by that time, 8th ed should be close to being released. 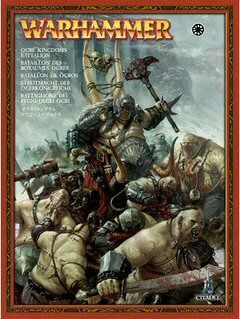 With the rumors I have heard about 8th ed and the rumor that they are one of the next armies to get a new book, there is hope that they will become a competitive army. 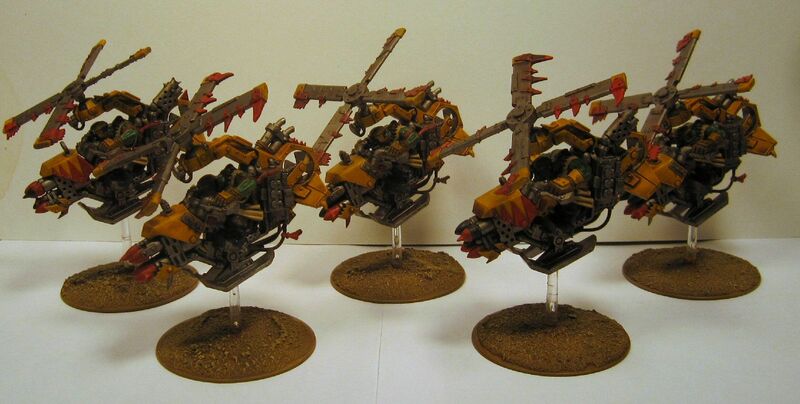 I have already picked up an OK Battalion and will start getting the big guys assembled and painted, once I have finished my Ork Deffkoptas that are due in two days, that is. I am also planning on picking up a Tyrant and a Butcher. If there are any OK generals out there that want to throw me some advice, please feel free to. It would be appreciated. I stopped by the LGS today to pick up some paint that I needed for my Orks and I was greeted with the arrival of the new Honoured Imperium terrain box. I am a fan of most of GW's terrain (as you can see in my personal terrain collection), so I picked up a box. Just for fun, I thought I would do a review of the product and show its contents. 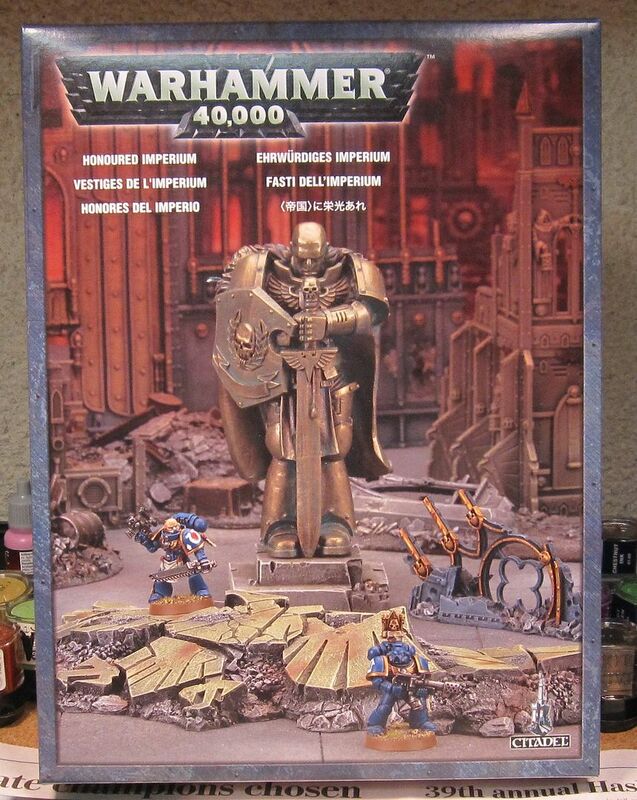 The set retails for around $25 US and contains three terrain pieces: a 6" Space Marine statue, a broken Aquila, and a section of ruined building that matches the Shrine of the Aquila ruined building set that is sold separately. 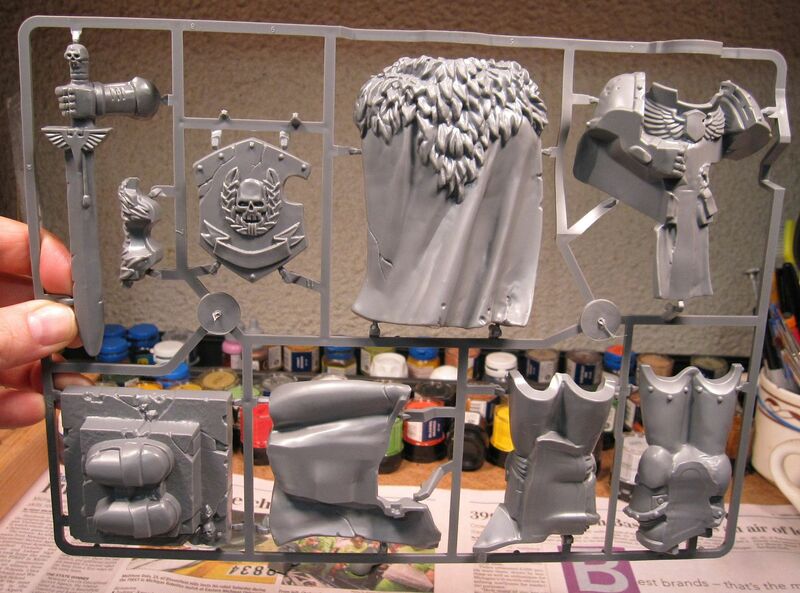 Upon opening the box, you will find two sprues. 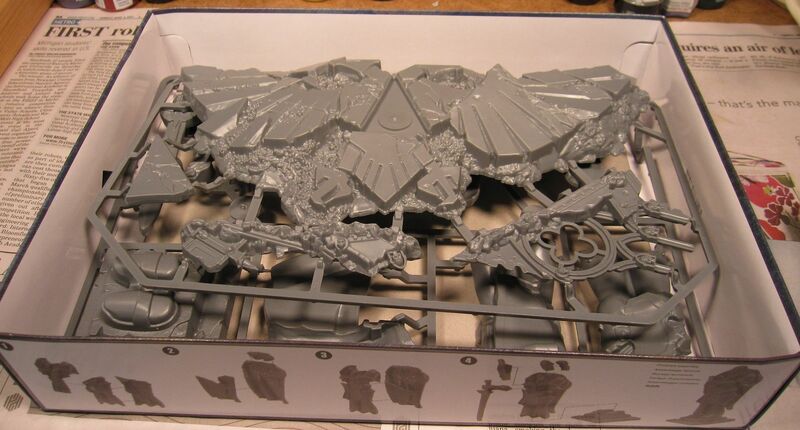 The broken Aquila and ruined building piece are contained on the first sprue, and each terrain piece consists of two pieces for easy assembly. The quality of the terrain is what I have come to expect from GW. They certainly are not the best pieces GW has ever produced, but they have produced worse. The contents are an odd selection IMO. The ruined building piece does not seem to fit with the theme of the box. Honestly, I would have liked to have seen a second statue in the box instead of the ruined building, but I am sure that would have increased the cost. Overall though, I like the set and I am looking forward to painting them up for my collection. This is my first product review and I would appreciate any comments that you may have. You may leave comments on the post or send me an email using the Contact link above. Thanks! 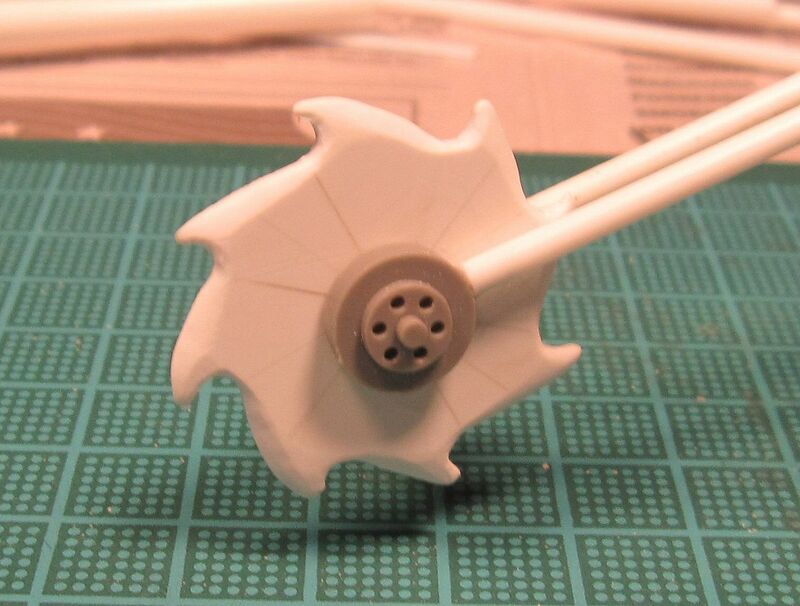 I have just about finished assembling the buzzsaw deffkopta. After talking with several people, I have decided that the buzzsaw I scratch made is not to big. 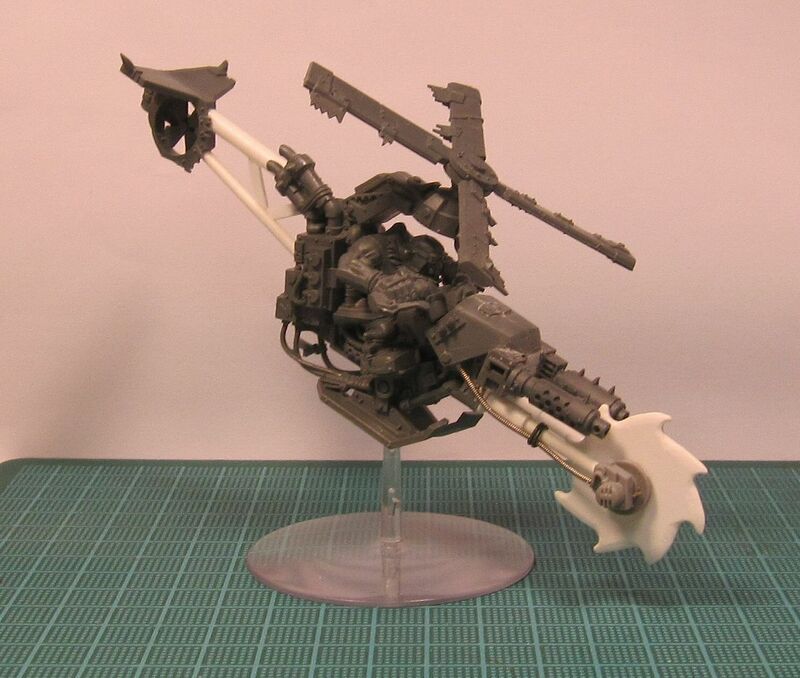 Several people actually said that with Orks, can anything be too big? I would have to agree. 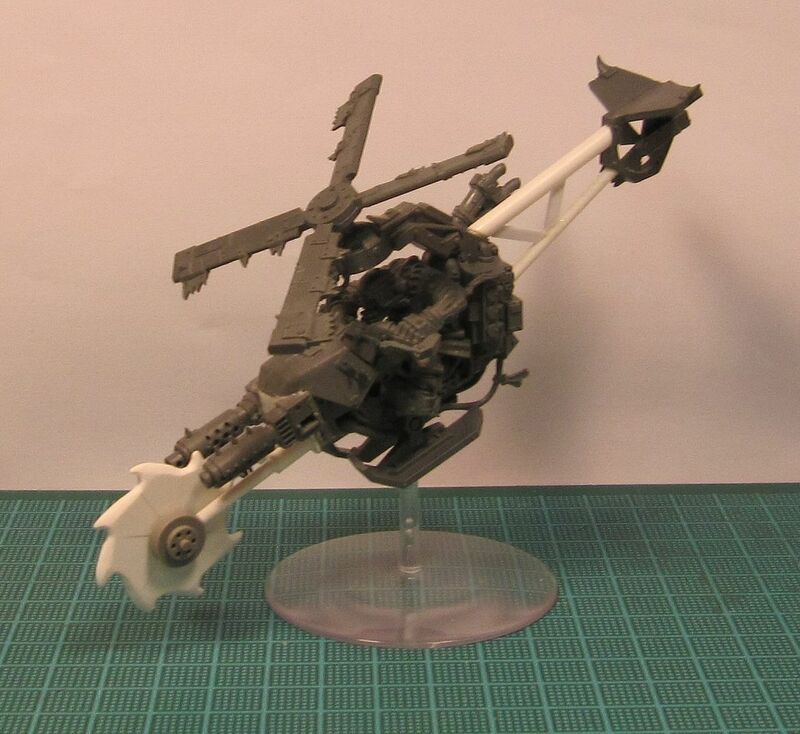 In order to mount it onto the front of the deffkopta, I needed to build a fork to mount it onto and that would look like the buzzsaw could spin. I started with a small track wheel from an old Lemun Russ kit that I had leftover and and cut the enclosed end off at a thickness of 1/8". 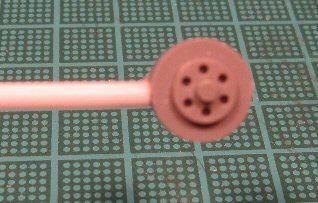 I then attached it to the end of a piece of plastic rod, like this. 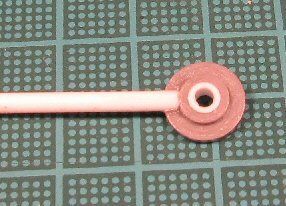 Then I cut of the other end of the track wheel at a thickness of 1/16" and attached it to a second piece of plastic rod. Since the original hole in the center of the track wheel was larger than the plastic rod I was planning to use for the axle, I used a piece of plastic tubing big enough to fit inside of the track wheel. I cut the plastic tubing so that it would allow for a gap between the buzzsaw blade and the mounting, making it look like the blade could spin inside the mounting. After cutting a piece of plastic rod for the axle, I began to assemble the mount and it looked like this. The only thing I needed now was some kind of motor. After a quick search of my bit box, I found the motor from an imperial searchlight. I trimmed the mounting base off the motor and attached it to the buzzsaw. Now I just need to mount it onto the deffkopta, which I will detail in my next post. I am getting a bit of a late start on my April project because I was too busy playing God of War III. But I have finished the game and although the urge to replay through it is hard to resist, I have to get going on my April project. So here are my first five Deffkoptas to paint. 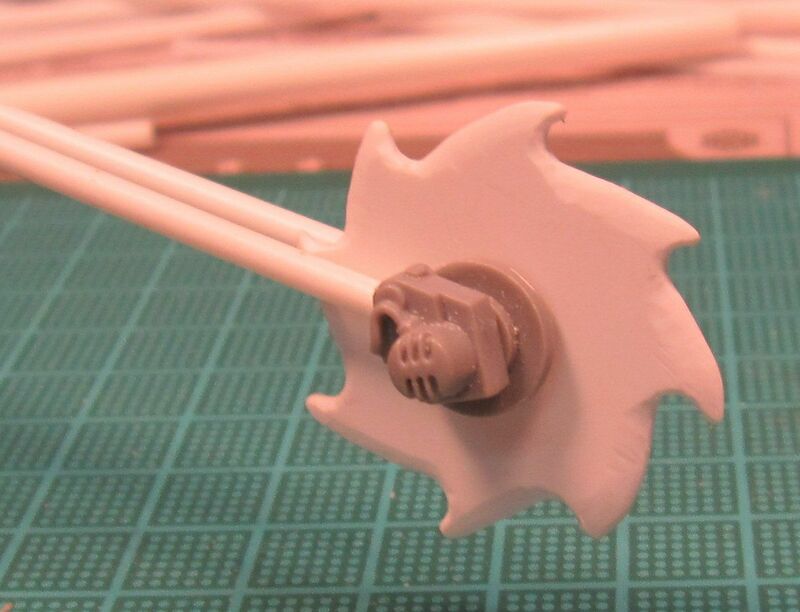 I have also started working on a sixth deffkopta, this one a conversion with a buzzsaw. 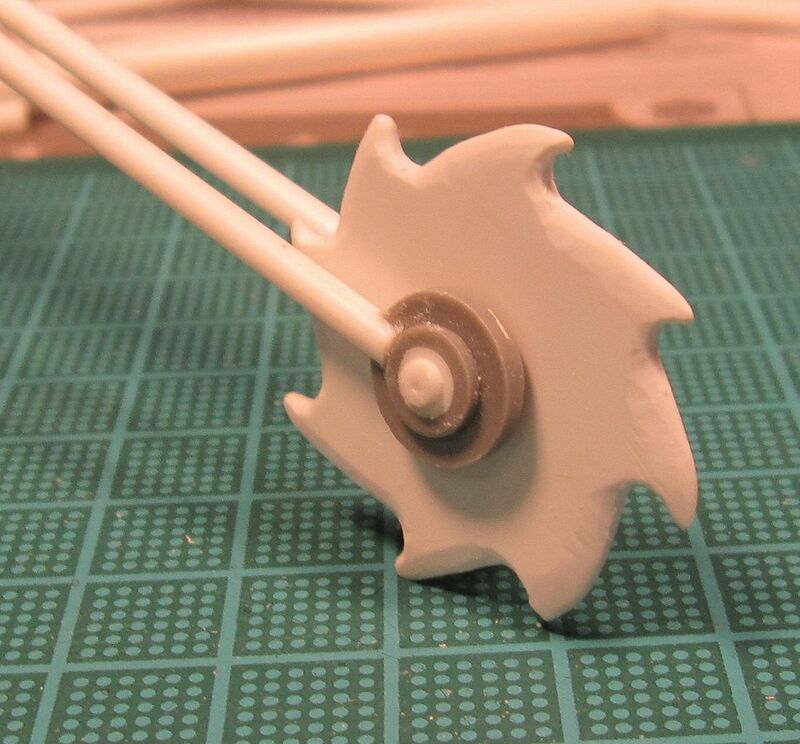 At first, I was going to use a leftover buzzsaw from the new Killa Kan kit, but it seemed too small. So I scratch made a bigger one. What do you think, too big?